A grand parade which honors the patroness Saint Anne. The festival is an annual event that rooted from religious and mythical beliefs that made up the ethnic race once called "taga-giik." There are different activities prepared to make the festival more meaningful and worthwhile especially to those foreigners who come and celebrate the festival with them. 5 MUST EXPERIENCE ACTIVITIES DURING THE FESTIVAL THAT YOU DON'T WANNA MISS! 1. "Karera ng mga Bangkang Lunday" (native boat race) It's the race of fishermen to get their goal - the biggest "banak" catch. 2. "Boys and Girls Festival Parade" Highschool students parade along the roads/villages to hang or offer Fish cone streamers as gifts to happy house owners. 3. "Banak Fish-Cone Tossing Ceremony" (tossing of fishcone streamers tied to bunches of balloons) Tossing which reminds the people the school of banaks jumping outside the water and going to the fishermen's boats. 4. 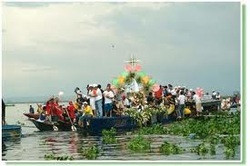 "Pagodahan" It's the parade of the image of St. Anne in the river. It starts in the Wawa of Laguna de Bay and ends in Ususan. Be surprised with an apple crashing to your head. 5. "Pandangguhan" The dancing procession of the image of St. Anne automatically starts after the parade in the river. The public is free to join with or without candles or lamps.